Ally’s latest update will now show in-browser previews for PDF’s, Word documents, and Powerpoint presentations. Previously, when you clicked on the Ally gauge to view your document’s accessibility score and list of any accessibility issues, you only saw an icon for the document in the main window. Now, Ally will allow you to view your document right in the browser and highlight where the specific accessibility issues are. No more guessing. It’s now much easier to identify the issue and then fix it. View the video below to see it in action. Kaltura Capture is Kaltura’s updated presentation and production tool, replacing CaptureSpace Lite. 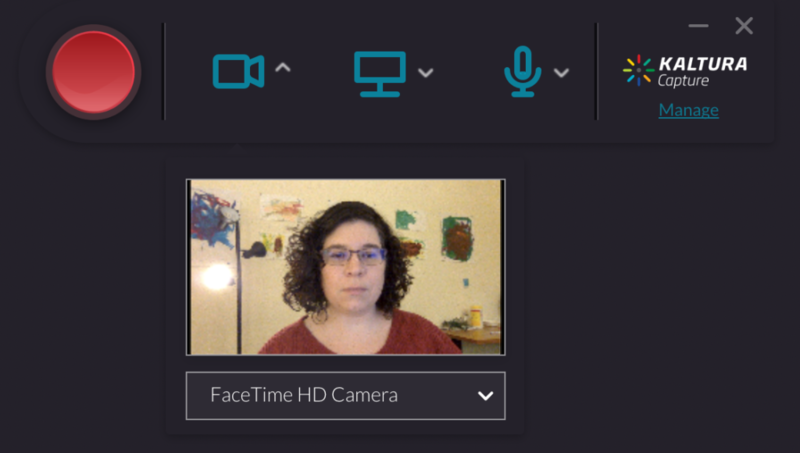 You may use Kaltura Capture to record any combination of your screen, voice, and webcam. These videos can then be easily uploaded to your My Media library in myLesley. Create a webcam recording as part of your course introduction. Narrate a PowerPoint presentation and post it in your course. Record an application demo on your computer. Walk your students through a process or analysis while providing commentary. Give a tour of your myLesley course. If you can view it on your computer, you can record it, narrate it, and share it with your students. Your students can then review it as often as needed. Kaltura Capture will be replacing the older tool: Kaltura CaptureSpace Lite. If you have been using CaptureSpace Lite, we recommend switching over to Kaltura Capture. Lisa Spitz is an assistant professor at Lesley’s College of Art and Design and the program director for the User Experience online BS degree program. Lisa worked with eLIS this fall to pilot a peer feedback tool, called Peergrade, in her Sketching for Interactive Design course. Below she shares her and her students’ experiences using Peergrade. In this course, students use sketching to document research insights, tell a story, and visualize mobile interface concepts and interactions. Each individual assignment includes a period of sketching and revising, where students provide peer feedback and then revise their own sketches for overall clarity. My initial experience teaching this course in Blackboard raised a number of challenges with the peer review process: not all peer feedback was of the same caliber and not all students received the same amount of feedback. This meant I was compensating for poor and/or incomplete feedback. I was also manually tracking the quality and quantity of feedback each student provided to their peers, for grading purposes. Further, due to inconsistencies in the types of feedback received, students reported finding it difficult to revise their work. Over the summer, John McCormick in eLIS introduced me to an online peer review platform called Peergrade. The overall format and structure of Peergrade was a good match for my particular assignment structure and I was interested in seeing how it might better support our students in the peer review process. The tool itself was fairly easy to learn. As an instructor, I was able to set up my “classroom” in Peergrade and create each of my assignments. For students, their experience entailed posting their sketches in Peergrade and then evaluating their peers’ sketches based on a custom rubric (which I set up in advance of the course running). The biggest challenge I faced was in tailoring the rubrics to each individual assignment. Students evaluated their peers work based on quantity and diversity of sketches as well as unique requirements for each assignment. The rubrics I created provided students with both quantitative and qualitative feedback on their sketches; and the system guaranteed that each student received feedback from three other students. In an ideal world, I’d spend more time user-testing assignment rubrics before launching these assignments with a live class. However, design is an iterative process and course design is no different and I anticipate refining each assignment rubric with each course instantiation. If you’re just not sure how this would work within your classroom context, I’d say start small. Choose one project in which you’d like students to give and receive quality peer feedback. Decide what a “good” assignment submission looks like and set up your rubric to probe specifically on those areas. Then, see what the experience looks like from both the Instructor and Student views. Having an initial experience with Peergrade will help you to determine just how and when it might be an asset in your courses. Peergrade is currently be used in a small number of online and on campus courses at Lesley. If you would like more information on using Peergrade or peer feedback in your courses, contact elis@lesley.edu. 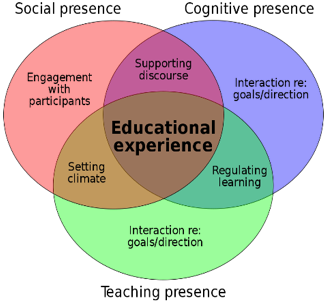 The concept of teaching presence in online course environments originated from the Community of Inquiry framework of online and blended teaching, developed by Randy Garrison, Terry Anderson and Walter Archer from the University of Alberta Canada. They define teaching presence as “the design, facilitation, and direction of cognitive and social processes for the purpose of realizing personally meaningful and educationally worthwhile learning outcomes” (Anderson, Rourke, Garrison, & Archer, 2001). While there are many elements supporting teaching presence, faculty are often interested in the impact of instructor-created videos on student learning. The effectiveness of video in supporting learning depends on a wide range of factors, but some broad guidelines can be helpful. For example, using video for whole-class feedback or guidance created specifically for one particular class or learning activity might be more impactful and less time-consuming to create than pre-scripted, canned videos. You may be curious as to the impact of your recorded visual presence within videos you create. In this video, the presenter reviews some research regarding the impact of having an instructor’s face in the video itself, as well as some general guidelines on the use of video. If you are creating videos to be used for multiple classes, consider how much time this may take and focus on issues or topics that are durable across longer periods (years) so that you can reuse the resource. The Blackboard Instructor app now allows you to grade directly within the app on your iOS or Android device (phone or tablet)! Please see the Grading in Blackboard Instructor video tutorial for more information. Want to learn more about the Blackboard apps for faculty and students? See Blackboard Mobile Apps for an overview of the Blackboard App for students and the Blackboard Instructor app.